Your dog can be an adorable part of your wedding — if he has the right temperament and training. Couples getting ready to tie the knot often want to make their dog part of their wedding day. Many envision their furry loved one sweetly walking down the aisle, wearing a beautiful dog-friendly wreath or matching bow tie. Quite the picture, right? But if you're hoping to include your pup in your wedding, how can you be sure the reality doesn't look more like your pooch careening down the aisle and knocking over the justice of the peace — or being intimidated and refusing to take part at all? We talked with Dr. Liz Stelow, a veterinary behaviorist at the Clinical Animal Behavior Service at the University of California-Davis Veterinary Medical Teaching Hospital, about how to determine whether your dog is right for your wedding — and how to make sure your wedding is right for your dog. Plus, she offered tips on how to train your pet for the occasion. First, Dr.Stelow says, you should think about whether your pet has the right temperament to take part in the wedding. “The type of dog that will do best in a setting such as a wedding is confident, focused, able to relax and very comfortable with crowds of people she doesn't know,” she says. Extremely hyper dogs or dogs who are fearful in new places or around unfamiliar faces will probably prefer to stay home. Will it be large or small? Indoor or outdoor?A large, outdoor ceremony is more likely to have numerous distractions that could make it difficult for your dog to remain on task. The length of the ceremony is also something to think about, as expecting a dog to wait patiently for 45 minutes or an hour might not be reasonable. Are you including loud organ music or a serene harpist?Remember, dogs are more sensitive to sound than we are, so big, loud noises could be quite scary for your four-legged friend. If you decide to go ahead and make your dog part of your big day, you’ll need to invest some time teaching her what you want her to do, and you have a few decisions you'll need to make ahead of time. For one thing, if you want your dog to walk down the aisle, you’ll need to decide whether you’re expecting her to do so on her own (not an easy task, as we'll get to in a moment) or with a dedicated person to guide her. Have her walk the route multiple times. Do the training slowly and with lots of great food rewards. Include recorded music and any items you're expecting your dog to wear in the training. Basically, if it's outside his normal, everyday routine, it should be practiced and rewarded. Once you've done plenty of training and feel confident in his ability to make an entrance, give him some practice with more distractions. Include numerous people for several “dry runs” so the dog can get used to how different the route feels with people there. If possible, do this many times leading up to your wedding day, but at the very least, you'll want to give him a bit of training during the rehearsal. Perhaps most importantly, Dr. Stelow says the owner must be realistic. “Most dogs, even those not concerned about the people and the noise, will find that staying on task long enough to get down the aisle alone is too much to ask. If [the owners] have great senses of humor and are looking for funny stories to tell about their wedding, they're best situated to have a loose dog at the ceremony.” Of course, it's still important that safety come first— a loose dog that runs over to Grandmain a small chapel might elicit a few laughs, but a dog taking off after a squirrel at an open, outdoor affair is just dangerous. Don’t forget that even if your dog makes his entrance successfully, you’ll still need to keep her well-behaved during the ceremony. “If a handler stays with the dog at the altar, he can give frequent treats to make that time fun for the dog,” Dr. Stelow suggests. Or, you can ask a family member in the first row to have the dog sit by them during the ceremony. If no one will be keeping the dog on leash, station a food puzzle or treat-dispensing device with which your dog is familiar near the altar to continue to make it worthwhile for the dog to be thereand assign someone to keep an eye on him. ​ “If it's not fun for the dog, it's not worth it!” Dr. Stelow says. Lastly, you’ll need to consider where your dog should go after the ceremony is over and his job is done. Dr. Stelow suggests a handler whose entire job is seeing to the dog because it helps make sure your dog is well cared for and can give the wedding party some flexibility.The person attending to your dog during the post-ceremony photography and reception might be different than the person who was in charge of him during the wedding, and that's just fine.A quiet crate can work for the dog who loves his crate. Or, someone can run the dog home after the ceremony and then join the reception. “Think of the dog as a child. 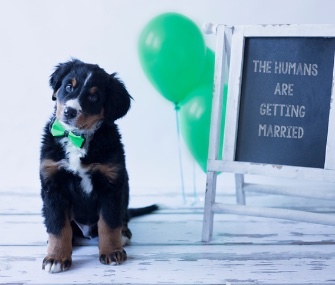 If you can't expect a child to sit nicely through the ceremony and reception that is planned, the dog would be equally challenged,” Dr. Stelow says. By following your dog’s cues and allowing yourself enough time for training, you can make your four-legged BFF a memorable part of your wedding day — if you decide it’s the right role for her. If not, remember, there are plenty of wedding-related photo opportunities before and after the big day that could easily be made dog-friendly!